Amity University conducts Amity Joint Entrance Examination for candidates aspiring to seek admission to engineering courses in the university. The entrance examination will be held in a CBT mode from the last week of April to the second week of May 2019. The application form of the exam will be available online as well as offline from October 2018. Students applying for Amity JEE need to pay an application fee of Rs.1100 which can be paid online through credit/ debit card, Net Banking or offline through demand draft. To know more about important details of the exam, read the article given below. How to Schedule Amity JEE 2019? Visit the official website of Amity University and log in using your application number and password. In order to select a test date and city, click on “Click here” button and schedule your exam. After that, you need to click on “Amity JEE 2019” button which appears on the screen and then click on “Next”. On clicking, exam policies will appear on the screen. Click on “Schedule this exam” button. Choose the test centre as per your convenience. You can choose at most 3 test centres. After selecting, click on the “Next” button. In the next step, you have to choose the exam date as per your convenience. After selecting and reviewing all the details, click on “Proceed to checkout” button. 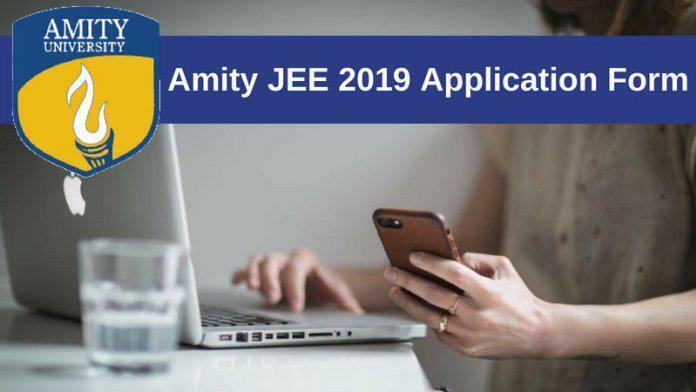 Don’t forget to check the eligibility criteria before filling the application form of Amity JEE 2019. The steps that you need to follow while filling the application form are provided below. Pay the requisite amount of application fee using a Debit/ Credit card/ Net Banking or through Demand Draft. After entering all the necessary details correctly in the application form, you are required to click on “Submit” button. After clicking, the duly filled application form will appear on the screen. Download and take a print out of the duly filled application form and keep it safe for future references. Note: Candidates can also fill the application form of Amity JEE in an offline mode. For this, students are required to purchase the application form from the Amity Campus and submit the same after filling it correctly. After filling the Amity JEE application form, students can book the test centre of their choice from the first week of February 2019. As per the exam pattern of the exam, there will be 90 MCQ type questions in the entrance exam. The entrance exam will be of 2-hour duration. The question paper will be divided into four sections named as General English, Physics, Chemistry and Mathematics or Biology. It is very important for candidates to remember that they have to attempt either Mathematics or Biology as per the eligibility criteria in the entrance test. Candidates have to attempt all sections in the question paper. Students will be allowed to leave the entrance test only after clicking on “End test” button that appears on the screen at the time of examination. While preparing for Amity JEE, it is very important that you prepare for the entrance examination strategically. So, all the best guys and focus on clearing the examination.